Last week Me and Mrs. Cool decided to put off any work we had a few hours when the kids were at school and were able to enjoy a little date day. 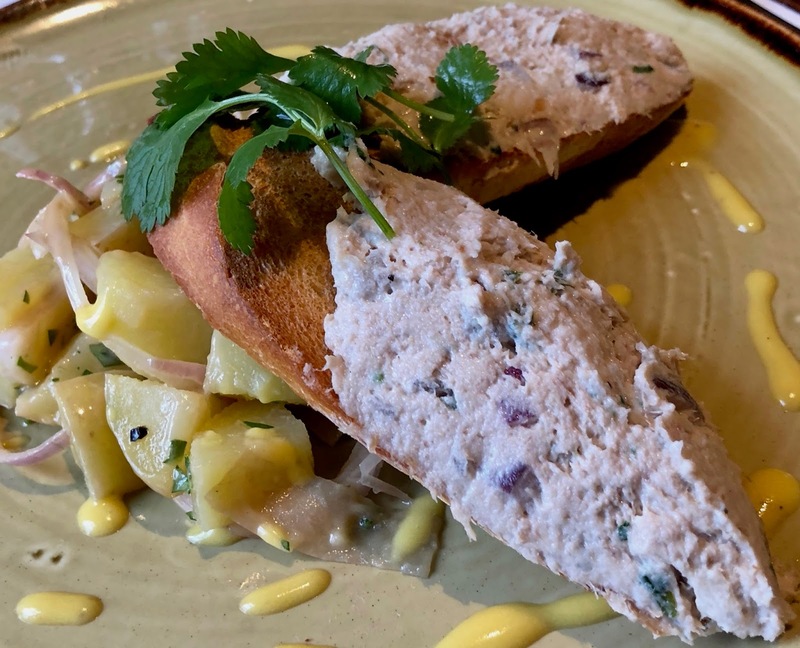 We decided to head to Hexham to try Bouchon Bistrot, A French restaurant that we have wanted to visit for a few years. 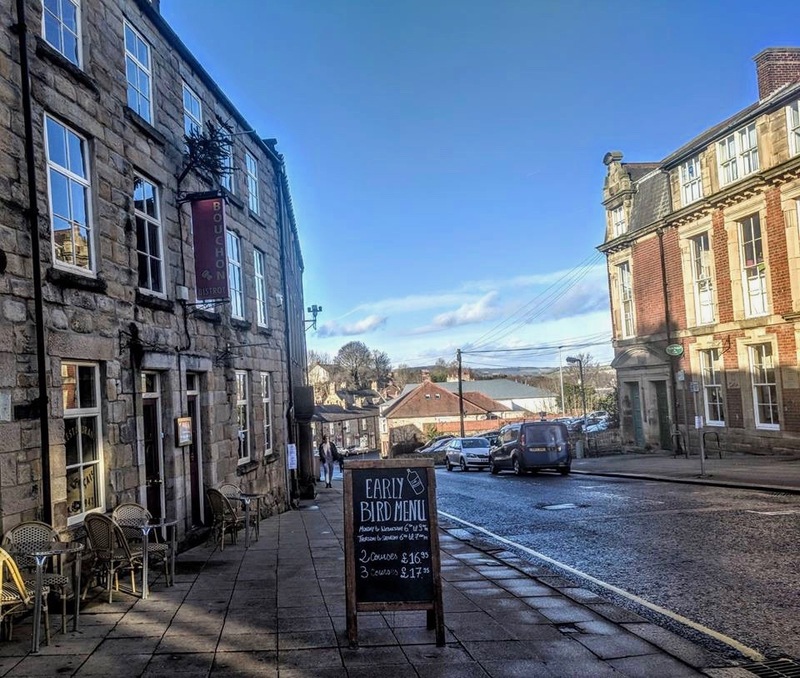 Bouchon Bistrot is an award winning restaurant very close to Market Square in Hexham and was named the UK's best local French Restaurant on Gordon Ramsey's The F Word. Our table was booked for 12pm and when we arrived we were greeted by the owner who was very friendly and showed us to our table. We ordered our drinks and were given a few minutes to look at the menus (you can see the menu on Bouchon Bistrot's webite here). As it was through the day we went for the Lunch menu which is very reasonably priced at £15.95 for 2 courses or £16.95 for 3 courses. 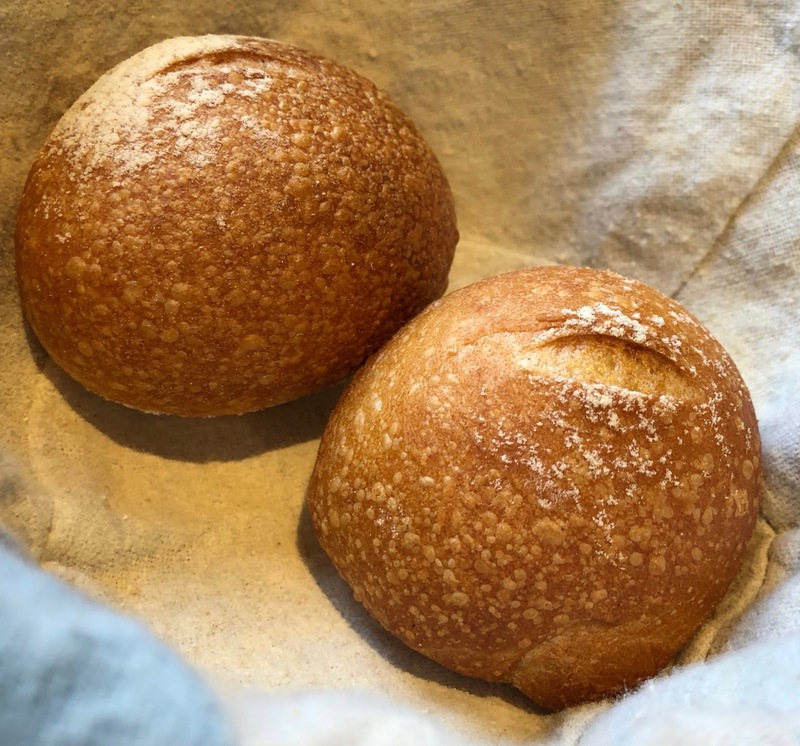 Our drinks arrived and we were also given a couple of warm breadbuns with butter and we ordered our food. For our starters Mrs. Cool went for the Goats Cheese Mousse with Beetroot Salad. I love the combination of goats cheese and beetroot and would normally go for this starter myself however I'm a sucker for Mackerel so when I saw Smoked Mackerel Tartines with Potato and Shallot Salad I knew I had to go for that one. Mackerel can be a bit like Marmite in that some people love it and some people hate it. I really love it, this dish is sooo good and very Mackerelly (is that a word? ), the Tartines went really well with the potatoes and shallots. 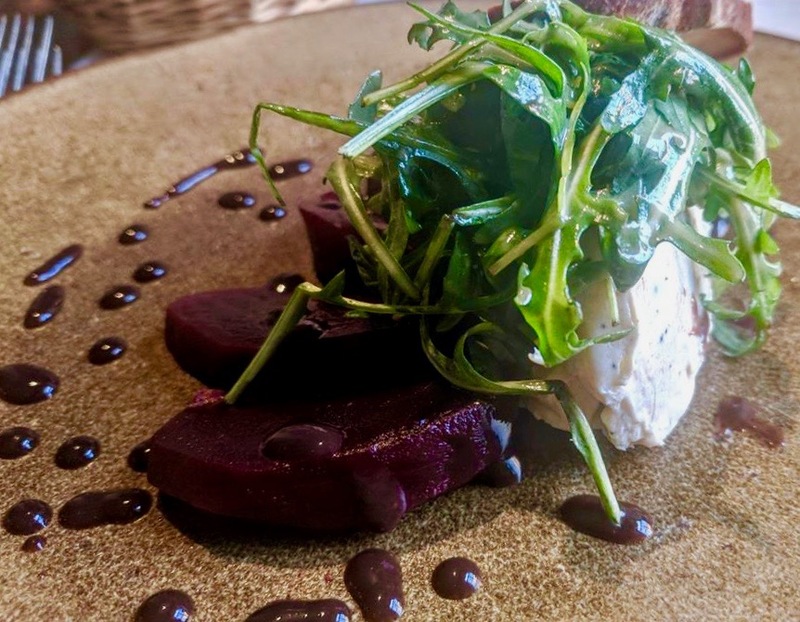 You can't go wrong with the classic combination of Goats Cheese and Beetroot, Mrs. Cool said the goats cheese mousse nicely seasoned with pepper and was the perfect portion size. Mrs. Cool loves a good steak so for her main she went for Steak Frites. 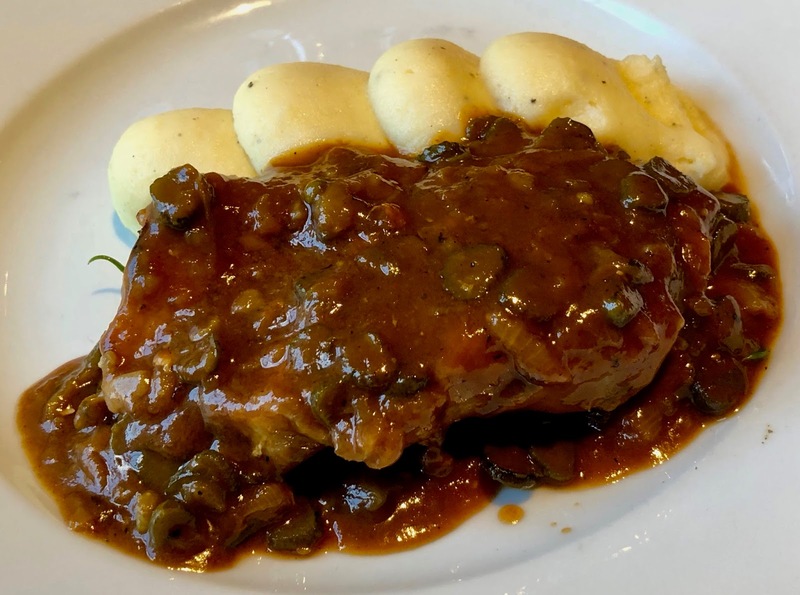 I was a little torn as I love steak too but I think I prefer pork so decided on the Grilled Pork Chop with Pomme Purée and Sauce Charcutière. The Pomme Purée was perfectly smooth and very well seasoned, The pork was incredible, so tender and succulent. The sauce was amazing too, very meaty with onions and I think chopped Cornichons. Mrs. Cool's Steak Frites also looked good, The steak was served Medium Rare and was melt in the mouth soft (Mrs. 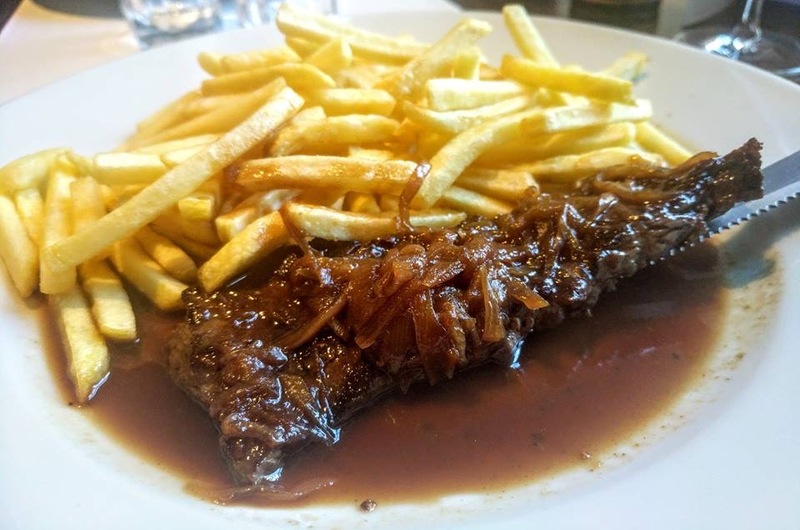 Cool said it was the softest steak she has ever had), the frites were thin and crispy and the sauce was very rich and meaty and was perfect for dipping her chips into. As it was only £1 extra we decided to treat ourselves to a dessert, Mrs. 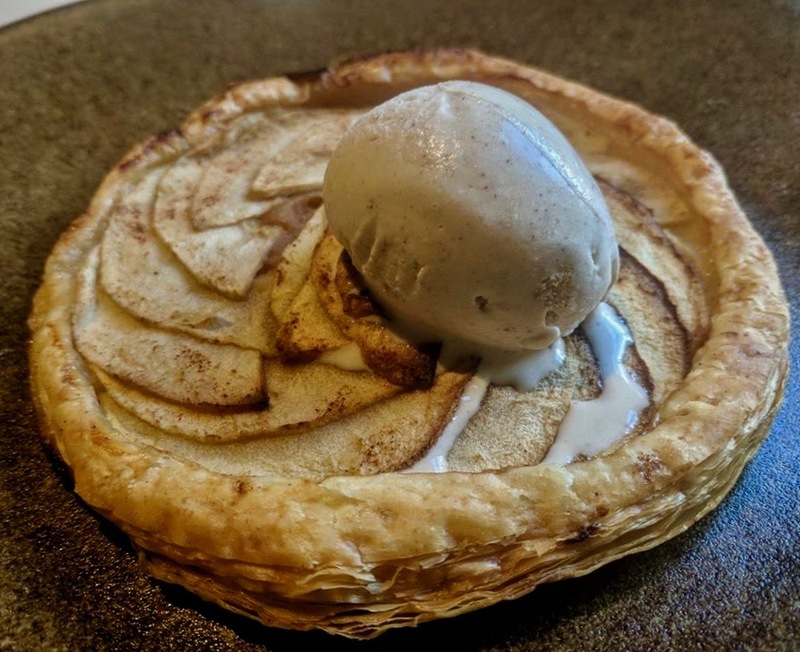 Cool chose the Tarte Fine Aux Pommes with Cinnamon Ice Cream. 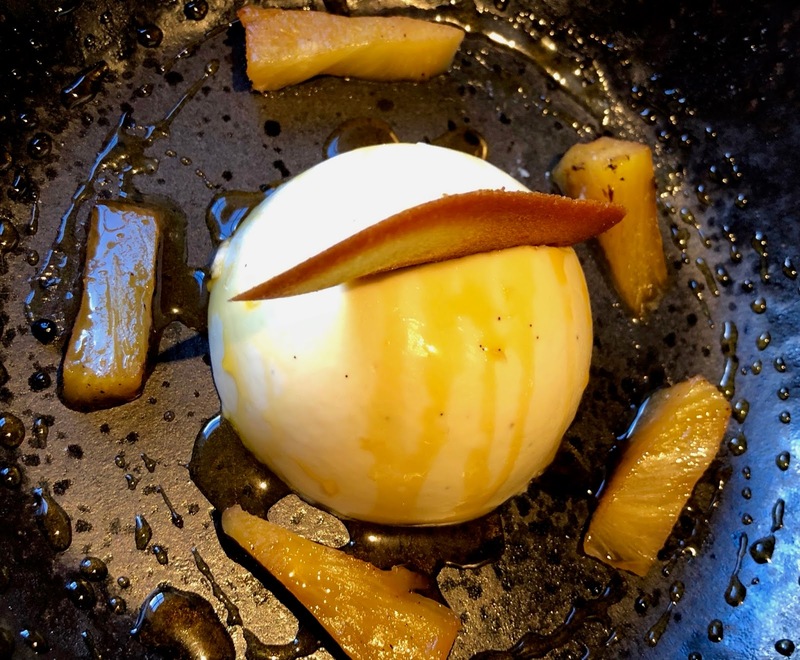 I was swayed by the thought of Rum and Pineapple so went for the Vanilla and Rum Bavarois with Roasted Pineapple. Although my dessert was delicious, very Creamy and the pineapple was particularly good, I was a little disappointed that the Rum was quite subtle and would have preferred this to be a stronger flavour. Mrs. Cool said the Tarte was beautifully flakey and the Cinnamon Ice Cream was perfect for winter. I had a little try of the Ice Cream and can confirm it is delicious. We were happy with all of our dishes and I recommend you make the time to visit Bouchon Bistrot. Our bill came to £49.10 including drinks and tip and we were very happy with this price. The food here looks sooo good! We've never got round to visiting as it's one of those places we'd probably have to drive to and then comes the argument about who will be designated driver! Going for lunch during the day sounds like a great idea! Looks so good! I love French food yet we hardly ever have it - another one for the list I think! I'm the same, me and Sam need to make an effort to have french food more often. This place looks amazing... making me hungry just looking at your pics. Love love love a good steak! I was soo jealous of Sam's steak. I think I'll have that next time we go. I haven't been to Bouchon for years! I remember it being delicious, a revisit is definitely on the cards.